An alleged robber lost an arm when a man from whom he stole a pair of Air Jordan sneakers chased after him in an SUV and hit him, pinning him against a fence in Brooklyn, police say and surveillance video shows. The alleged robber, 17-year-old Zachary Sam, was armed when he met with 39-year-old Phillipp Pierre, who thought he was selling Air Jordans to a buyer he met on Craigslist early Friday afternoon, police said. But when Sam entered Pierre's car at East 84th Street and Avenue M in Canarsie, he pulled a gun on him and demanded the sneakers, police said. A relative of Pierre, who asked not to be identified, told NBC 4 New York: "He put the gun to his head and told him he would shoot him, that he will not make it home to his family." 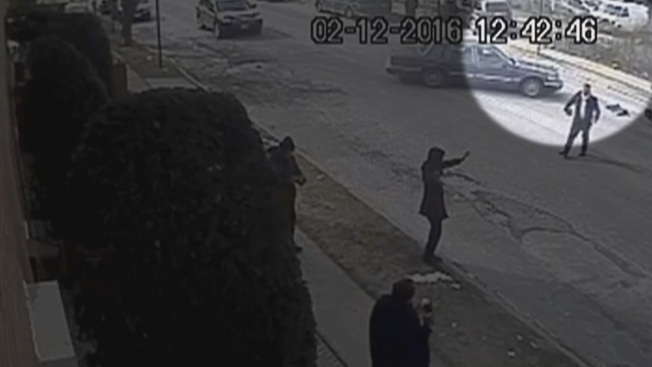 Surveillance video shows the teen getting out of Pierre's SUV with a bag containing the sneakers and calmy walking away, out of the video shot. The SUV also pulls away. The teen then walks back into the shot, and the SUV suddenly zooms in from behind, mowing him down. Pierre gets out the car, video shows, and he and Sam appear to scuffle as a crowd starts to gather. Sam then manages to flee, despite losing an arm in the crash, according to police. He collapsed in front of his home down the block. Sam was taken to Brookdale Hospital, where he was listed in serious but stable condition. He was charged with criminal possession of a firearm and second-degree robbery. The SUV driver and robbery victim, 39-year-old Phillipp Pierre, was also arrested. He's being charged with second-degree attempted murder. It's not clear if either man has retained an attorney. Pierre's relative said he did not hit the teen intentionally. "The kid pulled out the gun to shoot him while he was in the car, and that's when he tried to protect himself," the relative said. "That's why he accelerated and that's when it happened." "He's a very good man, he was making money for his family," the relative said. It's not clear what happened to the teen's arm lopped off in the crash.